Keene, New Hampshire takes its pumpkins seriously. Each year, the town tries to regain its status as World Record Holder for the most lit pumpkins during their annual Pumpkin Festival. Although Keene still holds the record for the most jack-o-lanterns in one place (28,952 in 2003), a competing festival in Boston beat out Keene with a total of 30,128 pumpkins on Boston Common. A Havertown, Pennsylvania man, Steve Clarke, holds the record as the world’s fastest pumpkin carver. 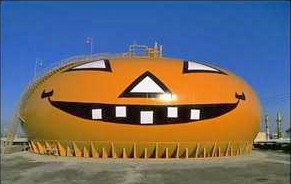 A pumpkin-shaped 3 million gallon storage tank in Los Angeles, California nicknamed Smilin’ Jack appears to be the world’s largest jack-o-lantern… literally. Although the Guinness Book of World Records sees it differently. Technically, Scott Cully carved the world’s largest jack-o-lantern at the Topsfield Fair in Massachusetts. At the Morton Pumpkin Festival in Illinois, as part of their annual Punkin Chuckin contest, pumpkins are hurled at great distances in order to maintain the world record. UPDATE: That record was broken by some guys who used their ‘Big 10 Inch’ air cannon in Moab, Utah, USA, on November 1, 2009. The biggest pumpkin pie happens to be from New Bremen, Ohio. It was 20 feet wide and 3,699 pounds. Here are the current world record holders when it comes to giant pumpkins. The heaviest pumpkin belongs to Chris Stevens of Stillwater, MN. It weighed in at just over 1,800 lbs. According to “the official page of recording pumpkin records,” all states weigh in here to maintain the largest pumpkins by state.